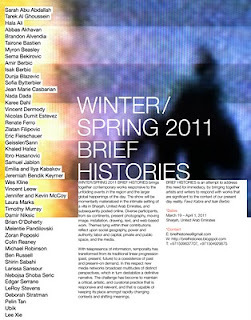 WINTER/SPRING 2011 BRIEF HISTORIES brings together contemporary works responsive to the unfolding events in the region and the larger global happenings of the day. Diverse participants, from six continents, present photography, moving image, installation, drawing, text, and web-based work. Themes lying within their contributions reflect upon social geography, power and authority, labor and capital, private and public space, and the media. With telepresence of information, temporality has transformed from its traditional linear progression (past, present, future) to a coexistence of past and present–on demand. In this respect new media networks broadcast multitudes of distinct perspectives, which in turn destabilize a definitive narrative. The challenge has become to maintain a critical, artistic, and curatorial practice that is responsive and relevant, and that is capable of keeping its place amongst rapidly changing contexts and shifting meanings. 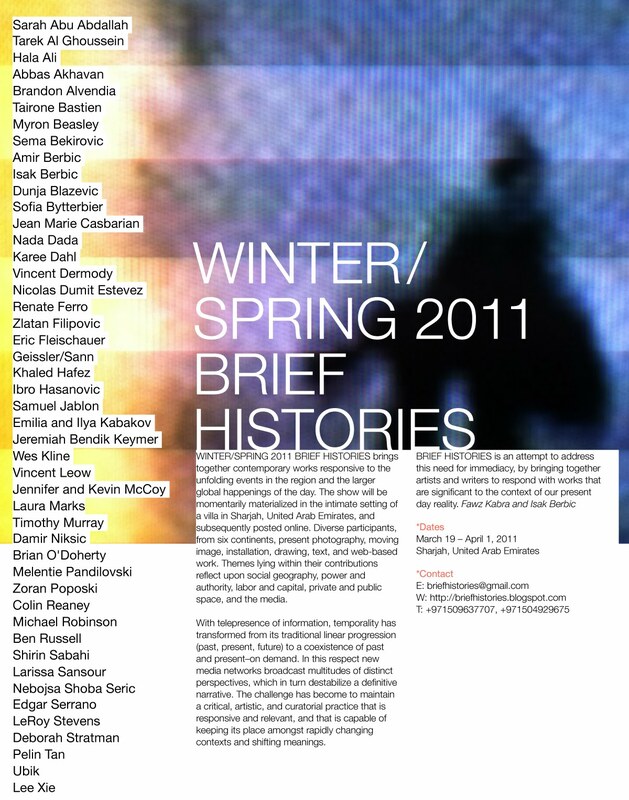 BRIEF HISTORIES is an attempt to address this need for immediacy, by bringing together artists and writers to respond with works that are significant to the context of our present day reality. Participating artists: Sarah Abu Abdallah, Tarek Al Ghoussein, Hala Ali, Abbas Akhavan, Brandon Alvendia, Tairone Bastien, Myron Beasley, Sema Bekirovic, Amir Berbic, Isak Berbic, Dunja Blazevic, Sofia Bytterbier, Jean Marie Casbarian, Nada Dada, Karee Dahl, Vincent Dermody, Nicolas Dumit Estevez, Renate Ferro, Zlatan Filipovic, Eric Fleischauer, Geissler/Sann, Khaled Hafez, Ibro Hasanovic, Samuel Jablon, Frans Jacobi, Emilia and Ilya Kabakov, Jeremiah Bendik Keymer, Wes Kline, Vincent Leow, Jennifer and Kevin McCoy, Laura Marks, Timothy Murray, Damir Niksic, Brian O'Doherty, Melentie Pandilovski, Zoran Poposki, Colin Reaney, Michael Robinson, Ben Russell, Shirin Sabahi, Larissa Sansour, Nebojsha Shoba Sheric, Edgar Serrano, LeRoy Stevens, Deborah Stratman, Pelin Tan, Ubik, Lantian Xie.